Republished from National Cancer Institute. 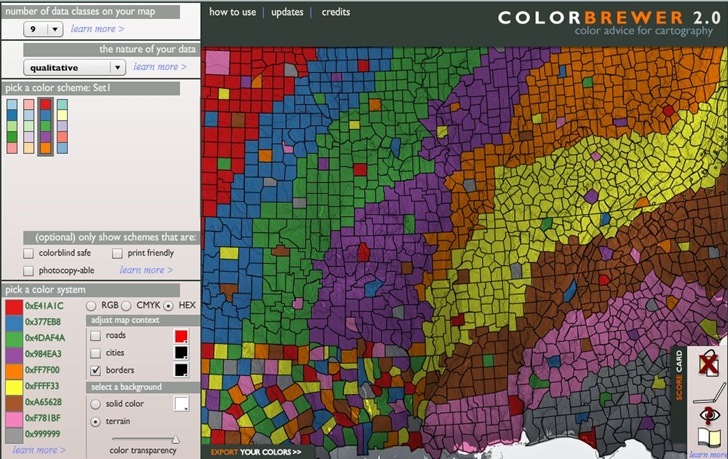 ColorTool is a plugin for ArcMap™ (part of the ESRI ArcGIS Desktop suite) that helps users create choropleth maps using ColorBrewer color ramps. The program runs from a button in the toolbar and opens a form that guides the user in choosing a classification scheme. For more information on the color options, visit ColorBrewer.org. ColorTool supports Quantile, Equal Interval, Natural Breaks (Jenks), and Unique Value classification types. Download the ColorTool plugin . . .
More options for color scheme export directly from the program, including an Excel file of all available color schemes, export in Adobe Swatch Exchange format (ASE), and in-program text hex color codes for copying and pasting into graphics programs. No more map zoom; I miss this option. This entry was posted on Tuesday, March 16th, 2010 at 7:00 am	and is filed under Best practices, Design, Flash, General, Mapping, Software. You can follow any responses to this entry through the RSS 2.0 feed. Both comments and pings are currently closed.